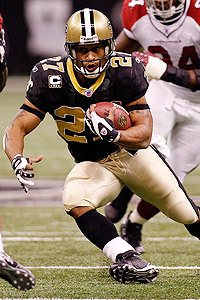 With Reggie Bush and Deuce McAllister, 2007 started with a lot of promise at the running back position. The surprise was that Antonio Pittman, who the Saints had moved up in the 4th round to take, was cut in favor of an UDFA rookie named Pierre Thomas. Unfortunately, both Reggie and Deuce struggled in the beginning of the year. Deuce tore his knee in the third game against the Titans. It was the opposite knee from his 2005 injury, but he was out for the year. With the load squarely on Reggie Bush’s shoulders, Reggie performed well for a few games, but started to struggle as he showed his lack of experience in a pro style run game, eventually succumbing to a knee injury himself, late in the season. Aaron Stecker filled in admirably, but Pierre Thomas was the bright spot in the last game of the season, rushing for 100 yards and also receiving for 100 yards. The Saints didn’t pick up any high profile RBs in free agency or draft any RBs in the draft. They did pick up Lynell Hamilton as an UDFA. The Saints have been carrying four running backs on the opening day roster in the last couple of years. Assuming that is the case in 2008, and the Saints don’t pick up another running back before the end of TC, that means that two backs currently on the roster will be cut at the end of training camp. It is very possible that the Saints will indeed pick up a veteran running back before TC ends, that is if Deuce does not show significant progress recovering from knee surgery in camp. The likely odd men out will be Chris Barclay and Lynell Hamilton. However, if Pierre Thomas continues to shine, and one of these youngsters really performs well, Stecker could become expendable. At 32, Stecker is getting up in age for a RB, and has only been seen as a dependable backup and third down back throughout his career. Last year was his most rushing yards in a season with 448. Pierre Thomas seems to be at least a younger version of Stecker, if not more. Chris Barclay, on the other hand, is a different kind of back. Now in his third year Barclay is small (5-10 180 lbs) and fast (4.4 40) and is seen as mostly a special teams player. Barclay shined brightly in NFL Europa’s last season (spring 2007), leading that league with 1,682 yards rushing. He was picked up by the Tennessee Titans as a kick returner for the first four games in 2007, averaging 21.7 yards on 14 kickoff returns. He could be competing against Tracy Porter and Skyler Green for kick returns, but would have to really be spectacular in order to stay on the team as just a kick returner. If Barclay shows that he can block well on third down, keeping Drew Brees safe, and performs admirably at RB, Saints head coach Sean Payton could keep Barclay as a backup 3rd down back and kick returner. At 180 lbs, that appears to be a tall order. Lynell Hamilton, on the other hand, is going to have to concentrate on RB skills in order to make the Saints roster. Hamilton was picked up as an UDFA by the Saints probably as a camp body and possibly a development player. His first year as a starter in college for the San Diego State Aztecs (2005) was a good one. But with two games left, Hamilton was injured and finished the year with 819 carries and averaging 4.3 yards per carry. But Hamilton lost his starting roll the next year to Brandon Bones and was relegated to the full back position. In his senior year (2007), he re-injured his knee early in the season and did not play much at all. Even at 6-0, 235 lbs, with a 4.57 40 yard dash at the combine, Hamilton was not on many team’s radars for the draft. Hamilton could end up being a diamond in the rough though. Since he played fullback and halfback in college, he should have a good knowledge of how to both run and block. Again that makes him useful for a backup role, which could push the aging Stecker out. The most interesting competition could be to replace Deuce if he is not ready to start. With Pierre Thomas as a fan favorite and a dual back system, coach Payton will be looking for someone to compliment Reggie. Something else the coaches may be thinking through is the future of the RB position. Is Reggie going to be ready to take the lead role? Is Deuce going to be able to carry the load for a few more years? Who is going to be the go-to guy in 2009 and beyond? I think Reggie certainly has the goods, only he needs to adjust his style of runnning. His acceleration is so explosive and his speed easily at the top of the league, that all he needs to use both of those elements more to his advantage. A perfect example is Devin Hester (Chicago). Though he lacks the overall talent of Reggie, his running style plays to his advantage. While Reggie tends to dance more, trying to make guys miss, Hester runs full speed and makes sharp cuts which do not decrease his speed, making it harder for the defence to wrap him up. The most they’re able to get is an arm around him, which is not enough to stop the amount of momentum behind him. But as Reggie slows down to dance, he looses than momentum allowing players to square their shoulders to him and he provides the rest of the defence with and opportunity to close their distance to him. If Reggie adapted his style and simply used his acceleration and speed similar to that of Hester, he’d be a serious force to be recokoned with! On a side note….I do love watching Pierre run!! I dont think that Reggie is a lead back. He wasnt at USC and he shouldnt be now. But in saying that I do believe he should always be on the field because the defense has to account for him no matter what. If they do underestimate him they will get burned. I will probably get roused for this but I think that we should also help Deuce out by having him split time with Pierre Thomas. That way we can nearly assure deuce will stay healthy and not take as much punishment. That may also keep defenses off balance with the change of pace. Pierre averaged 4.8 ypc last year. Gotta love the pottential with so many weapons. A lot of different people understand the basic keys of sample essay composing, however this does not mean they can compose superior quality essays, nevertheless a paper writing service should help to compose the college essay of great quality and show writing skills of students.